SACRAMENTO REGION, CA (MPG) - While visiting the Fine Art Exhibition at the California State Fair this year people were gathering around a man tossing clay into the crowd, telling them to, “Make something.” He let participants know that it was a judgement free zone. Chris Thompson volunteered every day of the fair, inviting young and old to join in the act of creating something from a lump of clay. Thompson was the featured representative of a local sculpture group, Valley Sculpture Artists (VSA), which promotes three-dimensional art. He shared how his own love of making things with clay began at the age of nine when his mother tossed him a hunk of porcelain clay. He was hooked. Surprising numbers of children and adults lingered while working their clay - some for up to 20 minutes. When they finished, Thompson invited them to keep it or add their sculpture to what has become known as the “ArtValanche.” It is art until the time a portion crashes to the ground (which it did at least 40 times), then it is an avalanche. He carefully retrieves each piece and places it back on the mountain of creations, some intricately crafted with striking detail. Thompson estimated approximately 18,000 fairgoers had accepted his ‘clay experience’ during his 19 days at the fair, turning over 1,000 pounds of clay (donated by Alpha Ceramics) into their own works of art. He noted the incredible amount of energy put into each piece. He also noticed that many of those who seemed the least excited to accept his challenge, claiming that they weren’t artists, produced some of the best tiny sculptures. Thompson is not new to sharing his love for art with his community. He received the Artist of the Year Award from the Sacramento Arts and Business Council after facilitating a five county project creating “A Thousand Bowls to Feed the Hungry” in 2013. He tossed and shaped the bowls and local art organizations volunteered to glaze and sell them. This project helped to raise awareness for the arts while yielding over $42,000, which was donated to local non-profits. In addition, Thompson recently received the prestigious 2018 Don Herberholz Award for Sculpture. 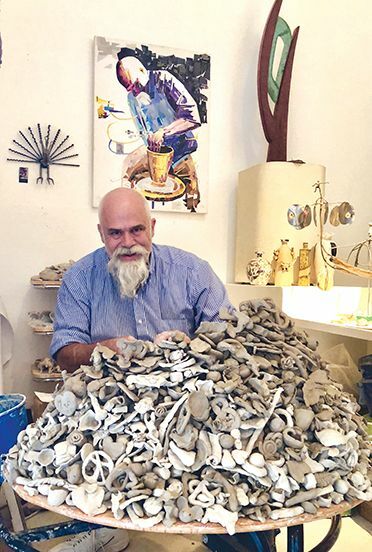 When not creating and exhibiting his own ceramic art, Thompson teaches classes to children and adults at A.C.A.I., an up and coming gallery in Fair Oaks. He is a celebrated ceramic artist and member of Valley Sculpture Artists. Visitors are welcome to visit Allied Ceramics Art Institute and Gallery (ACAI) located at 7425 Winding Way in Fair Oaks. A new show of exciting pieces begins each third Saturday of the month with an artist reception from 6 p.m. to 8 p.m. Hours are Wednesday-Friday from noon to 4 p.m. and Saturday from 11 a.m. to 3 p.m. Admission is free. For more details visit websites: www.sacramento365.com and www.acaistudios.com or email: information@acaistudios.com.